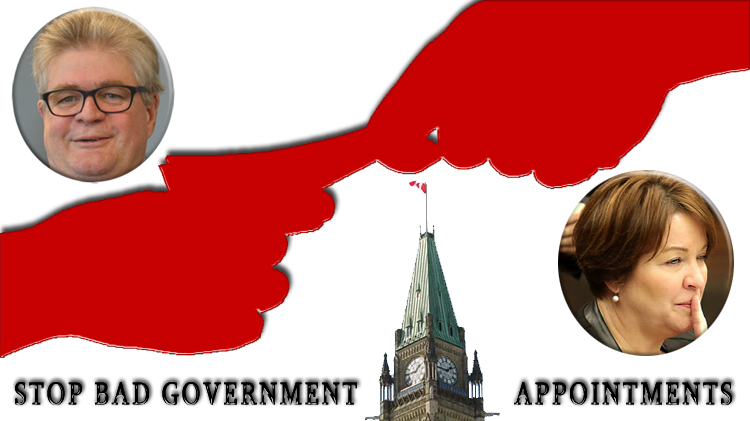 OTTAWA – Today, Democracy Watch released the document it obtained through an Access to Information Act request that shows the Trudeau Cabinet had qualified candidates for both the Ethics Commissioner position and the Lobbying Commissioner position in spring 2017. The document confirms at the bottom of the first page what the Trudeau Cabinet hid from opposition party leaders and the public – that more than 50 people applied for each position by April 2017, and that some were qualified for each position. Democracy Watch requested many more details about the appointment processes in its request filed with the Privy Council Office, including all communications between the selection committee members, and it believes that the Cabinet must have many more documents than have been disclosed. It has filed a “missing records” complaint with the Information Commissioner that is currently being investigated. “What other damaging details are the Trudeau Cabinet hiding about the appointments of the new Ethics Commissioner and Lobbying Commissioner?” asked Duff Conacher, Co-founder of Democracy Watch, which is challenging the appointments in Federal Court, with the hearings scheduled for this Wednesday, November 14th and Thursday, November 15th. Instead of sending the list of qualified candidates in April 2017 to opposition party leaders to consult with them on who should be appointed as the new commissioners, the Trudeau Cabinet decided to re-appoint Ethics Commissioner Mary Dawson and Lobbying Commissioner Karen Shepherd to their third, six-month renewable terms, likely because they both had confirmed records of letting almost everyone off the hook (including several Trudeau Cabinet ministers and lobbyists), and so the Cabinet wanted to keep them around as long as possible. Those decisions in April 2017 preceded PM Trudeau’s move in mid-May 2017 to recuse himself from the appointment process for the new Ethics Commissioner because the Commissioner was investigating him for accepting the Bahamas trip gift from the Aga Khan. This raises the question of whether Trudeau took part in the April 2017 decision to reappoint the Ethics Commissioner. Minister Bardash Chagger was chosen by PM Trudeau to take the lead in making the appointment decision for the new Ethics Commissioner. Trudeau did not recuse himself during 2017 from the appointment decision concerning the Lobbying Commissioner, even though the Commissioner was investigating three situations involving lobbyists’ putting Trudeau in a conflict of interest. See details about those situations here and here and here. Then, in June-July 2017, PM Trudeau and Minister Chagger sent letters to opposition party leaders that misled them by not mentioning that the Cabinet had qualified candidates for both the Ethics Commissioner and Lobbying Commissioner positions. (See sample letter from Prime Minister Trudeau here). The letters didn’t even mention that the Cabinet was required to consult the opposition party leaders on the selection of the commissioners (under subsection 81(1) of the Parliament of Canada Act (for the Ethics Commissioner) and subsection 4.1(1) of the Lobbying Act (for the Lobbying Commissioner)). At the time of the appointments by the Trudeau Cabinet, the Ethics Commissioner was not only investigating PM Trudeau, but was also investigating Finance Minister Bill Morneau for his role in developing and introducing Bill C-27. The Lobbying Commissioner was not only investigating the three situations involving Trudeau but also another situation involving Minister Chrystia Freeland. “Democracy Watch is challenging the appointments of the new Ethics Commissioner and Lobbying Commissioner in court because Prime Minister Trudeau and his Cabinet ministers were biased as they were being investigated when they made the appointments, and they also failed to consult with opposition party leaders on the appointments as required by federal law,” said Duff Conacher, Co-founder of Democracy Watch. “The Trudeau Cabinet’s appointment processes were secretive, political and partisan, and misled opposition parties and the public, all of which is far from the open, transparent, merit-based appointment processes the Liberals claim they use,” said Conacher. More than 15,000 Canadians have sent a letter through Democracy Watch’s Stop Bad Government Appointments Campaign calling on the federal Liberals to make the Cabinet appointment process actually independent and merit-based (as Britain has) for appointments of all judges, officers of parliament, and members of agencies, boards, commissions and tribunals. The independent commission, whose members would be approved by all federal party leaders (and entities such as the Canadian Judicial Council) should be mandated to do a public, non-partisan merit-based search for candidates, and the Cabinet should be required to choose appointees from a short-list of one to three candidates that the commission nominates.